The Denver Gold were 0-1 as they took on the Birmingham Stallions in a United States Football League game on March 3, 1985. 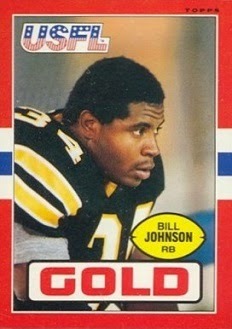 A team that drew well at home but failed to post a winning record in either of its first two USFL seasons, the Gold now was coached by Darrel “Mouse” Davis, formerly of Portland State and most recently offensive coordinator of the Houston Gamblers. Utilizing the high-powered run and shoot offense, the Gamblers had been exciting and productive. Now Davis was bringing the same scheme to Denver, but the run and shoot had misfired in the opening week 31-10 loss to Oakland. Birmingham, coached by Rollie Dotsch, was coming off of a 14-4 record in ’84 and won its first contest of 1985 (over New Jersey). The Stallions had QB Cliff Stoudt and WR Jim Smith, both formerly of the Steelers, and ex-Buffalo RB Joe Cribbs as key players on offense, which was anchored by an outstanding line. There were 27,400 fans in attendance at Legion Field in Birmingham and they saw Denver get off to a fast start. On the offense’s first play from scrimmage, QB Vince Evans connected with RB Bill Johnson on a screen pass that gained 55 yards to the Birmingham one yard line. Johnson carried on the next play to gain the final yard and a touchdown and Brian Speelman added the extra point. The Stallions responded by driving 80 yards in eight plays. Cliff Stoudt finished the series off with a seven-yard TD run and Danny Miller tied the score with the point after. It seemed as though the Gold would score again on the next possession as they reached the Birmingham nine, but FS Chuck Clanton recovered a fumble to snuff out the threat. Three plays later, however, Stoudt fumbled a bad snap that went out of the end zone for a safety to put the visitors back in the lead by 9-7. Early in the second quarter, Evans threw long to RB Vincent White for a 48-yard touchdown. Speelman’s PAT put the Gold ahead by 16-7. Shortly thereafter, a Stoudt pass was intercepted by Clanton and, two plays after that, Evans completed a pass to WR Leonard Harris for a 39-yard TD. Speelman again converted and Denver was up by 23-7 with 8:33 remaining in the first half. Later in the period, the Gold put together a 48-yard drive in nine plays that concluded with Speelman kicking a 28-yard field goal. The Stallions got a break on defense when Clanton intercepted his second pass of the game, returning it 23 yards to the Birmingham 48. Stoudt tossed a touchdown pass to Jim Smith eight plays later that covered nine yards with 32 seconds left on the clock. Miller kicked the extra point and the score was 26-14 at halftime. Early in the third quarter, the Stallions drew closer as Stoudt threw to WR Joey Jones for a 53-yard TD. Miller converted and the Denver margin was down to five points at 26-21. The Gold came back with a 10-play, 78-yard series that was capped by Evans gaining one yard for a touchdown on a quarterback sneak. Speelman’s kick made it a 33-21 contest. Early in the fourth quarter, Denver scored again when Johnson ran eight yards for a TD, followed by another Speelman extra point. The Stallions had opportunities to close the gap again, but twice came up empty inside the Denver ten in the final period. They picked up two more points when Evans was tackled in the end zone for a safety, but it was of no consequence as the Gold came away with a convincing 40-23 win. Denver compiled a total of 564 yards, with 284 coming on the ground, to 325 yards for the Stallions. The Gold also had the edge in first downs (24 to 19) and time of possession (35:02 to 24:58). However, Denver was hindered by five turnovers, to just one suffered by Birmingham, and 12 penalties, while only five flags were thrown on the Stallions. Vince Evans completed 14 of 28 passes for 284 yards and two touchdowns, although giving up three interceptions. RB Todd Gerhart led the impressive running game with 119 yards on 21 carries, followed by Bill Johnson’s 74 yards on 9 attempts that included two TDs, and Evans contributed 50 yards on five carries. Leonard Harris topped the Denver receivers with four catches for 74 yards. For the Stallions, Cliff Stoudt was successful on 17 of 38 throws for 259 yards and two TDs, giving up one interception and scoring once on the ground. Joe Cribbs had just 36 yards on 9 carries. Jim Smith caught 6 passes for 83 yards and Joey Jones gained 96 yards on four receptions that included a TD. Chuck Clanton (pictured at left) starred on defense, accumulating all three interceptions, recovering a fumble, and getting credit for eight tackles. Denver won four of its next five games on the way to an 11-7 record that placed second in the Western Conference. 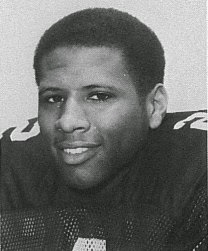 The team ranked third in the USFL in total yards (6629) and, with Vince Evans splitting time at quarterback with Bob Gagliano, rated third in passing yards (4550). In the Gold’s only playoff game, they were thrashed in the Quarterfinal round by the Memphis Showboats. The Stallions recovered to go 13-5 and finish at the top of the Eastern Conference. They defeated Houston in the first round but lost to the Baltimore Stars at the Semifinal level.